The phrase "space mission" put the astronauts under considerable pressure and workload, and the CIMON program aims to study the possibilities of interaction and collaboration between humans and robots, and hopes to provide the necessary assistance to the crew during the space missions. 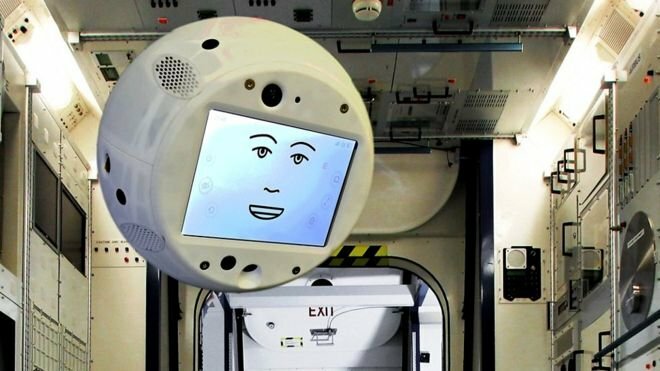 On June 29, aboard the International Space Station (ISS) located 400 kilometers from Earth, the first robot equipped with Artificial Intelligence: CIMON (Interactive Mobile Companion Crew), a sphere of five kilograms in weight and 32 centimeters in diameter who has the ability to see, hear, understand, speak and fly around the edge of the space laboratory of the ISS. Cimon, which speaks English, was the product of an alliance between AIRBUS and IBM with the supervision of the Ludwig-Maximilian University Hospital (LMU) for the German aerospace agency. In its memory bank it has a version of Watson AI (from IBM) that works without the need of data connection. The robot was tested on Earth with Captain Alexander Gerst, who will be responsible for its use in space during the Horizons mission for the European Space Agency that will last between June and October 2018. The structure of CIMON is made of plastic and metal, created with 3D printing. He was trained using voice samples and photos of Alexander Gerst, and the procedures and plans of the Columbus module of the International Space Station were loaded into the database. The CIMON mission is a technology demonstration designed to show researchers how humans and machines can interact and collaborate in the space environment. reading my article. I truly appreciate you!